My fascination with quirky jewelry is growing rapidly, I simply can't resist uniquely made accessories and if the word hand made comes to the equation I'm certainly sold ! 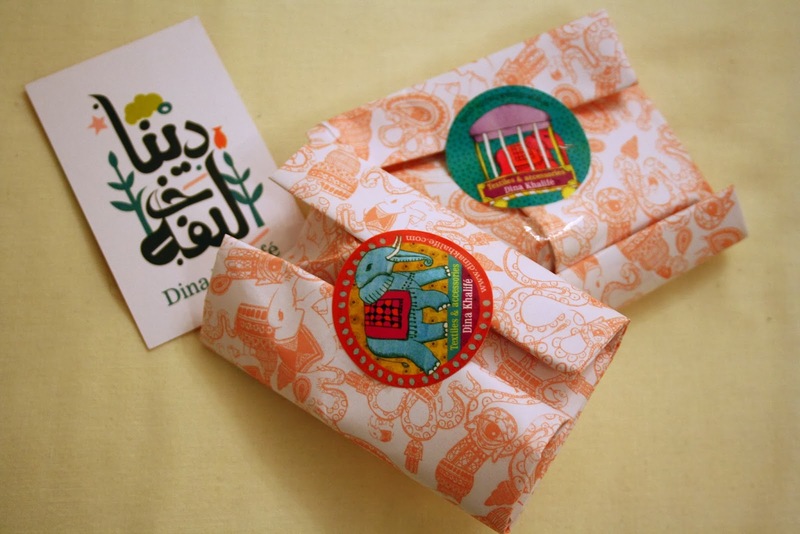 Dina Khalife a designer I've came to know through out instagram. Her designs are certainly out of the box and quirky . Along of making her own prints and hand painting her jewelry this mixture is certainly quite astonishing..
Lucky for me our fantastic fella Noaf the mastermind behind Pretty Little Things celebrated her second anniverasy last week and got a selection of talented regional designers to showcase their merchandise. I managed to make sometime, it was literally 30 minutes to check out Dina in specific since the weather was a bit too chilly to take.. I had my eyes on these rings the minute I saw them on her instagram, as you know of my obsession with the eye emblem now I'm growing fond of anything has hands and those dainty cute rings sure counts so I got two of them to wear each one differently and got and elephant print headband since I couldn't find the peplum top I was aiming to buy..
And isn't her packaging something? So cute to be thrown away!